Topics: A-master A-frames, Informer A-frames, Booster A-frames, & Premier Chalk A-boards. The site is programmed for PHP/5.5.21. 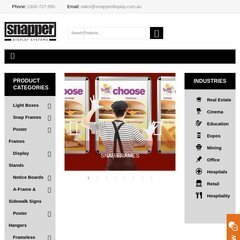 It is hosted by Synergy Wholesale Pty Ltd (South Australia, Verdun,) using LiteSpeed web server. PING (103.9.170.42) 56(84) bytes of data. A time of 209 ms, is recorded in a ping test.